She's A Taikonaut - China Is Sending Its First Woman Into Space : The Two-Way China is preparing to launch a female taikonaut, or astronaut, into space this weekend. It's the first time a Chinese woman has traveled into space. 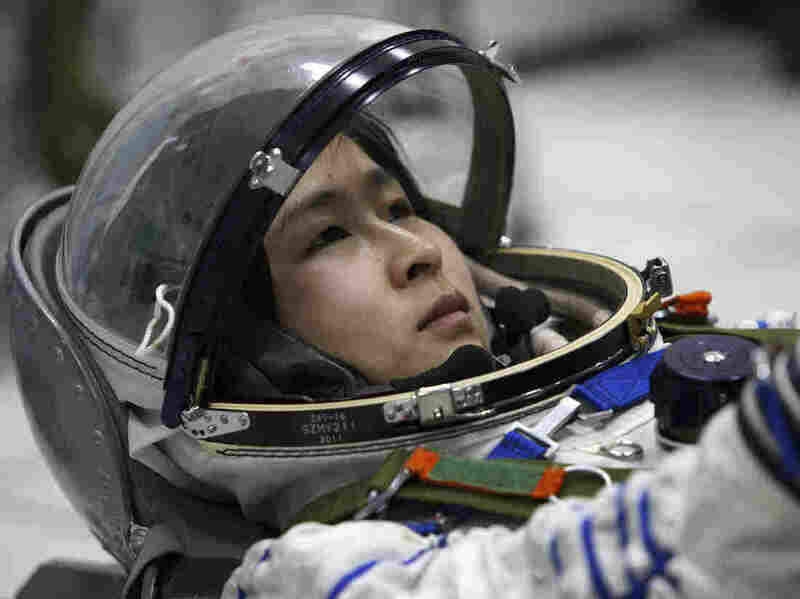 Liu Yang, China's first female astronaut, trains in Beijing in April, 2012. She's not an astronaut or cosmonaut - Liu Yang is a taikonaut, and tomorrow she's scheduled to become China's first woman to venture into space. She's one of a three member team scheduled to lift off aboard the Shenzhou-9, accompanied by Jing Haipeng and Liu Wang. Chinese media featured glowing reports about Liu's prowess, noting she's a Chinese air force major and a military pilot with a cool head. According to China Daily, in 2003, birds struck the engine of a plane Liu was piloting. She lost the right engine but stabilized the aircraft and made a safe emergency landing. Watch out, Sully. Liu was recruited in 2010 to join the taikonaut corps. A spokeswoman for China's space program remarked "Generally speaking, female astronauts have better durability, psychological stability and ability to deal with loneliness," according to Xinhua, which ranked her with Sally Ride, the first U.S. female astronaut, and Russian Valentina Tereshkova, the first woman in space. Her crew's mission is also historic: the Shenzhou-9 will dock with an experimental space module, the first time China has conducted a manual space docking. This is another step on China's deliberate path toward building a space station by 2020, and plans for a trip to the moon, according to Space.com. China is not a member of the International Space Station effort, notes AP, because of U.S. opposition to Chinese participation. That's likely one reason why China embarked on its own space program in the 1990s.